Goodreads says, "London, 1938. The effervescent "It girl" of London society since her father was named the ambassador, Kathleen "Kick" Kennedy moves in rarified circles, rubbing satin-covered elbows with some of the 20th century's most powerful figures. Eager to escape the watchful eye of her strict mother, Rose, the antics of her older brothers, Jack and Joe, and the erratic behavior of her sister Rosemary, Kick is ready to strike out on her own and is soon swept off her feet by Billy Hartington, the future Duke of Devonshire But their love is forbidden, as Kick's devout Catholic family and Billy's staunchly Protestant one would never approve their match. When war breaks like a tidal wave across her world, Billy is ripped from her arms as the Kennedys are forced to return to the States. Kick gets work as a journalist and joins the Red Cross to get back to England, where she will have to decide where her true loyalties lie—with family or with love . . ."
The Kennedy family lives in London now thanks to Joe Kennedy's job as ambassador. After being presented to the Queen, Kathleen "Kick" Kennedy is now in the same social circles as some of London's elite. That night she is celebrating her debut and she meets Billy Harrington, the future Duke of Devonshire. He is certainly smitten with her and as she starts to develop feelings for him, she realizes that things are more than a bit complicated. The Kennedys are very serious Catholics and his family is Protestant, not to mention they are also an aristocratic British family. How would this ever truly work? As time goes on and World War II breaks out, Billy joins the military and Kick heads back to the states. With oceans separating them along with their family's strict rules, do they really stand a chance? 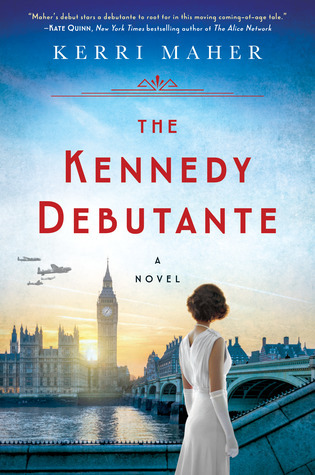 Kerri Maher's debut, The Kennedy Debutante, will excite fans of the Kennedys as well as fans of Downton Abbey and historical fiction. I knew a bit about Kick through other novels I read about the Kennedys, but The Kennedy Debutante truly brought her to life. I always found her to be fascinating, especially since she rubbed elbows with the British aristocracy and took London by storm. It was like being in the world of Downton Abbey with its fancy dinners, grand estates, beautiful country homes, and of course the aristocracy, but it had that American Kennedy flair, too. Kick was the best of both worlds. I have always found the Kennedys to be the most fascinating American family, so The Kennedy Debutante was right up my alley. I could tell that Maher researched Kick and her experiences in London very well and the other Kennedy family members felt very authentic. Kick's life story, along with the a lot of the Kennedys, is perfect for fiction, because their lives were, well, stranger than fiction and I mean this in the best way possible. They are a larger than life family and I think Maher captured this well. I do wish Maher made me feel more of a connection to Kick. Oftentimes, I didn't feel a genuine connection, but once things started to progress with Billy a bit more, I did care more about her. I really wanted things to work out for them, but there were a ton of road blocks. One particular road block, being religion. It seems ridiculous as they are both Christians and their religions are so very similar, but I guess for the time period as well as for the Kennedy family that not being Catholic was a deal breaker. Then there was the war, which was the ultimate road block. I liked learning more about Billy's roll in the war as well as Kick and her plans for helping out. It was heartbreaking and romantic at the same time. I think the war truly put things in perspective for them. Kick didn't just stay in America where it was safe. Her story was equally fascinating. The other events that happen to the Kennedys along the way are just as mind-blowing as the main conflicts in The Kennedy Debutante. I mean you can't make this stuff up. I won't give too much away if you aren't well-versed in the Kennedy family, but it was truly unbelievable. My heart goes out to Rose Kennedy, the matriarch, as she had many difficult challenges thrown in her path despite her cushy upbringing. The Kennedy Debutante will definitely be a hit if you love the Kennedys and perhaps wanted to learn more about the charismatic Kick Kennedy. Be forewarned, that a Kennedy story never truly ends happily, so be ready for some major bumps in the road. This story will have you googling the real Kick Kennedy to just confirm various events in her life that will leave you with your mouth gaping and completely astonished. I totally agree! The Kennedys are larger than life - everybody wants to know what their lives were like. I don't know who Kick is but your review makes me want to read all about her! Is this a series? I think you'd like this one, especially if you enjoy the Kennedys. Kick's life is really fascinating. It isn't a part of a series...at least to my knowledge. Thanks for visiting, Joy! I feel like I know more about the more modern Kennedy family, so I'm eager to get to this one to learn more about some of the older branches. I agree that they are such a fascinating family! And I love the Downton Abbey vibes. They really are...unbelievable lives...oftentimes it feels like the Kennedy Curse follows them around. The Downton vibes were definitely fun. I hope you can read this one soon! Thanks for visiting, Angela!